The Yankee Pedlar Inn of Torrington, Connecticut, offers 60 individual bathrooms with private baths, each adorned with stenciled walls and period furniture and restored with the most modern of conveniences. Since 1891, The Yankee Pedlar has been known for gracious hospitality and homegrown warmth. It also has a reputation for being haunted. 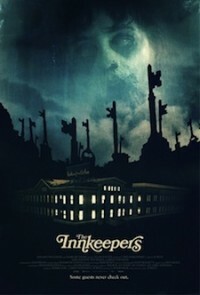 From filmmaker Ti West (The House of the Devil) comes The Innkeepers. Believed by many to be one of New England’s “most haunted hotels,” The Yankee Pedlar is about to shut its doors for good. As the Inn’s final days draw near, the remaining employees – Claire (Sara Paxton) and Luke (Pat Healy) – set out to uncover proof of its haunted past.